“Bertha M. Clay” is an interesting figure in the history of 19th century literary piracy. Prior to 1891, there was no American law governing republication of foreign works. As a result, many American publishers reprinted foreign works without obtaining permission or paying authors. While this may have been unethical (and many authors, including famous names like Charles Dickens, objected loudly), it wasn’t technically illegal, and the practice was widespread. One victim of this piracy was prolific British romance novelist Charlotte M. Brame. Many of her works were reprinted in America by multiple publishers, sometimes under false names. One of the most common Brame aliases was Bertha M. Clay (note the similarity of initials), which was frequently used when Brame novels appeared in dime novel format. 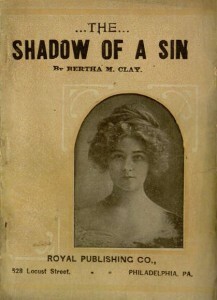 In fact, the fictional “Bertha M. Clay” was so successful that, after Brame’s death, American authors began to write additional “Clay” books in imitation of her style. It probably goes without saying that this situation makes it a bit difficult to figure out the origin of some books from this period. Fortunately, a very detailed Charlotte Brame bibliography is available through Victorian Secrets’ Victorian Fiction Research Guides to help sort out the confusion. According to the guide, The Shadow of a Sin was first serialized between November, 1874 and January, 1875 in the Family Herald, a British story paper. The edition in our collection is undated, but we know that it was printed in Philadelphia, most likely in the late 19th or early 20th century. If you would like to help turn this old volume into a modern eBook, you can read about our proofreading project and then visit the project page.